Koraput: Nandanik, a Theatre group based in Koraput, Odisha celebrated its 4th foundation day by holding the first edition of the Foundation Day Lecture. The lecture, titled The relevance of non proscenium theatre in the present scenario was delivered by Shri Subodh Patnaik, internationally recognized theatre director from Odisha. 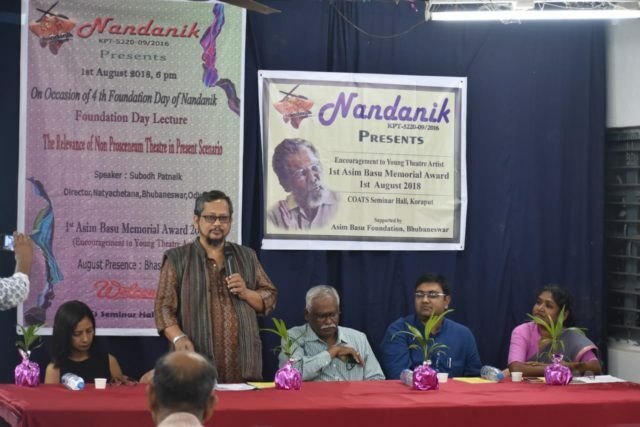 Sourav Gupta, creative director of Nandanik said in his opening note said that academic institutions follow the practice of foundation day lecture and theatre is also an academic process so this lecture is being constituted which is to follow every year. Justifying the topic he also said that since Nandanik is exploring non proscenium spaces in Koraput so it is essential to gather knowledge about its aesthetics. 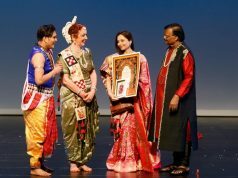 Speaking on the occasion, Shri Patnaik lamented the fact that in India the European Proscenium Theatre is being widely practiced as mainstream and also supported by the government whereas India’s own folk drama which is primarily non proscenium is utterly neglected. 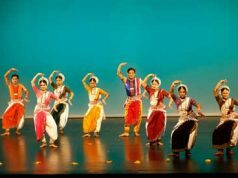 Shri Patnaik mentioned several non proscenium spaces world over and in India which has been existing prior to advent of proscenium. He traced the history & development of Indian Theatre in context to the Natyashastra. He explained the aesthetics of non proscenium theatre mentioning greats like Badal Sircar & contemporary practitioners like Ratan Thiyam, Probir Guha among others. He concluded by saying that there is no conflict between two and both have to learn from each other, however, non proscenium theatre is ailing and needs support. The lecture was delivered for one hour & forty five minutes in front of a packed audience. 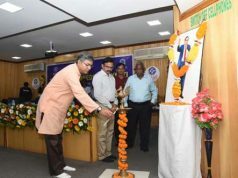 The session was presided over by Shri Gauri Prasad Rath, who in his presidential remarks traced the open air theatre practice in Koraput region. The first Asim Basu Memorial Award 2018, named after Shri Asim Basu, the late thespian of Odisha Theatre as a mark of encouragement to young theatre artist was given to Saumendra Kumar Swain from Nandanik, Koraput. Bhaswati Basu, actress & daughter of Asim Basu gave a speech on her father and gave away the award. She was extremely appreciative of Nandanik’s initiative to encourage new generation to take up theatre. The vote of thanks was delivered by Monideepa Gupta. The programme was compeered by Dr Jhansi Singh, Lecturer, Semiliguda College & held at COATS Seminar Hall, Koraput. On 3rd & 4th August, Nandanik is going to hold the 3rd edition of the Deomali Jatiya Natya Mahotsava 2018. This year the festival features plays by teams from Bhubaneswar, Sambalpur, Kolkata and Koraput. Arjun Samataray from Bhubaneswar will perform his solo Ichcha. Rajesh Panda with his batchmates of Drama Department of Sambalpur University will perform Station under the banner of Natyashala. Nandanik will premiere its new play Takshaka by Manoj Mitra under the direction of Sourav Gupta. The main attraction of this festival is the staging of Kushilab, a Bangla play by the 52 year old Theatre Workshop from Kolkata. The play is a solo performance by Shri Ashok Mukhopadhyay, a veteran of Bangla theatre stage who has worked with greats like Sambhu Mitra, Ajitesh Bandyopadhyay & Satyajit Ray to name a few. Apart from plays there are other items like film screening, instrumental music etc. The Deomali Jatiya Natya Mahotsava is a multi state multi language theatre festival started in 2016 by Nandanik with an aim to facilitate cultural exchange between theatre of Odisha & other states. In last two years plays have been staged in Odia, Bangla, Marathi, Hindi & Urdu language. This is the only national level theatre festival in south Odisha organized by a theatre group without any government grant. Formed in 2016, Nandanik is a theatre group operated by youth of Koraput under the direction of Sourav Gupta & Monideepa Gupta with help from local youth. Since its inception on 1st August 2016, Nandanik has catapulted Koraput onto the national cultural map by its continuous theatre activities including drama productions by seniors & children, workshops, festivals and seminars. Nandanik has collaborated with national government organizations like Eastern Zonal Cultural Centre, Kolkata & Sangeet Natak Akademi, New Delhi.